If you are sitting in front of a computer reading this, with warm shelter and have food to eat, you have reason to be thankful. If you have people who you love and love you, you have reason to be thankful. If you live in freedom and don’t fear for your life, you have reason to be thankful. If the world you live in, even if it consists of difficulties and uncertainties still provides you with some degree of hope, you have reason to be thankful. If you are healthy, or if you’re not but have moral and practical support during the hardest times, you have reason to be thankful. If you live in peace, you have reason to be thankful. 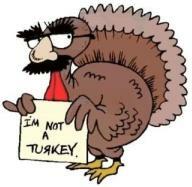 But most of all, on this Thanksgiving, if you’re not a turkey…..